Fall is one of my favorite times of year. The temperatures are crisp, there’s the smell of cinnamon and burning fireplaces in the air, and the deciduous trees are turning beautiful shades of red, orange, purple, and yellow. Those amazing colors are why I love taking fall foliage drives. Fall color drives are especially fun for me, as I’m a Florida boy. While we actually do have some fall foliage in Florida (yes, many of our deciduous trees really do change color – just later in the autumn than in most of the country), I have to take a trip at least a few hundred miles north to see brilliant autumn foliage. I even check the fall foliage report to see just where the best autumn colors should be each year and when the leaves are expected to change. So, where are the best places to go for fall foliage drives? Here are 5 amazing autumn driving ideas, in no particular order. For some terrific places to go see fall colors, check out these Michigan fall color tours along the Upper Peninsula. Drive there, and you will surely enjoy a brilliant show, especially in the first week or so of October. With the many lakes, ponds, and miles of coastline along Lake Huron, Lake Michigan, and Lake Superior, there are countless opportunities to enjoy some stunning vistas that include majestic stands of colorful trees and serene water. Approaching from the south, you can take the beautiful Mackinac Bridge (Interstate 75) to the Upper Peninsula and keep heading north along the interstate, or veer west along Lake Michigan Scenic Highway (U.S. Route 2). Or, follow your nose and see where it takes you! Here are 10 fall road trip ideas through the Upper Peninsula of Michigan. The Pacific Northwest offers abundant opportunities to enjoy autumn in all of its brilliant radiance, with the highways and byways of Oregon perfect for fall foliage drives through and around the Cascades and Coast mountains. Interstate 5 is the main north-south highway through Oregon, tracing fairly close along the coastal regions, while Interstate 84 traverses east and west primarily along the northern part of the Beaver State. A fall foliage drive in Oregon should definitely include McKenzie Pass – Santiam Pass National Scenic Byway (Oregon State Highway 242). The best time to enjoy fall colors in Oregon is mid to late October. Keep your eye on these Oregon fall foliage updates for the latest color changes. Arizona is a dynamic state with a wide array of climate zones, and conditions particularly in the northern part of the Grand Canyon State allow for a beautiful array of fall foliage colors from mid September through mid November. Drives along U.S. Highway 89 will take you through an elevation change of more than 4,000 feet in the relatively short distance of 80 miles and plunge you into a mountainous kaleidoscope of fall color that covers the entire autumnal spectrum. Here are the best places to view Arizona’s fall foliage, as well as the current fall foliage report for 4 of Arizona’s national forests. There is perhaps no more famous a place for fall foliage drives than the Blue Ridge Parkway, which extends 469 miles from the Great Smoky Mountains National Park in North Carolina to Shenandoah National Park in Virginia and takes motorists by and through a multitude of other national parks and historic sites. The Blue Ridge Parkway, which was first constructed in 1935 and wasn’t fully completed until 1987, takes roughly 4 days to be enjoyed at a leisurely pace along its entire stretch, and is a fall leaf peeper’s paradise (usually) during mid through late October. 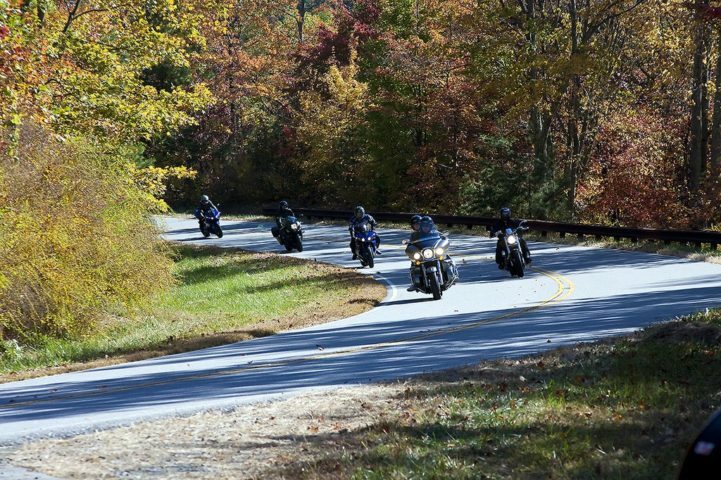 The parkway meanders both east-west and north-south, has east and west slope exposure, and ranges in elevation from around 650 feet near the James River in Virginia to more than 6,000 feet just south of Mount Pisgah in North Carolina. Before you go, be sure to check the latest fall color reports along the Blue Ridge Parkway. Here are some tips for where to drive to see the best colors. Let’s face it, there isn’t any one state in New England that doesn’t offer a terrific fall color drive in late September through mid October. The Green Mountain State has the highest percentage of maples in New England, a tree that turns vibrant shades of yellows and oranges and provides a splashy backdrop against the deeper reds and purples. This might be, in part, why Vermont is so ironically linked to fall color displays and is a tremendously popular fall color tour destination. Vermont Route 100 is perhaps one of the most famous fall foliage drives in all of New England, running around 216 miles long, from the state’s southern border with Massachusetts in Stamford north to Vermont Route 105 in Newport. Here are tips for finding the best Vermont fall colors.